Drains & Drain Kits LP | Hawk Research Laboratories, LLC. 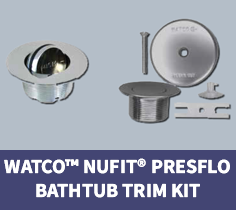 The tub trim kit fits into existing strainer bodies 1.5-inch inner diameter and larger. The stopper simply snaps into place. No threaded parts, levers or knobs are needed. To open and close the stopper, press on any edge. 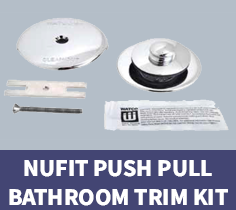 The trim kit includes overflow plate, adapter bar to change from a two to a one hole plate, attachment screw, body with stopper, a suction cup to remove stopper and epoxy packet. 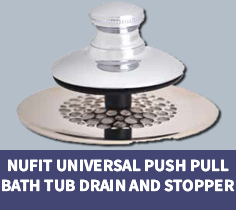 The push pull tub trim kit fits into all existing strainer bodies with either a 3/8 inch or 5/16 inch threaded hole in the cross bars. The new push pull stopper screws into the cross bars of the old strainer body. The kit includes an overflow plate with screw, adapter bar, body with push pull stopper and epoxy packet.